Paradise overrun by pests…. The story sounds apocryphal, even Biblical. Even the dates are disputed (1950’s? 1960’s? ), moving the tale into the realm of urban myth. The only thing that everyone does agree on is that in the middle of last century, frogs fled the Los Angeles River and swarmed Elysian Valley. The Eden-named enclave became known as Frogtown, as if the frogs had enchanted the area, casting it into warty oblivion. If the neighborhood was a fairy tale, Frogtown would be the princess under a spell, laboring in obscurity until her true beauty was rediscovered. The happy ending? In real life, this is actually what happened. Decades after the amphibian invasion, artists like Derek Boshier, Michael Todd and Frank Romero (whose rainbow-tiled live/work space is currently for sale) led the artist immigration into the area, which was also revitalized due to the efforts of architect Tracy A. Stone (one of Frogtown Artwalk’s movers and shakers) after she heard a city planner suggest the rezoning of Frogtown warehouses, which allowed occupants to apply for artist-in-residence status. In the Frogtown Art Walk’s fifth year, Stone’s studio will host three of the thirty artists participating in the free, self-guided, dusk-into-dark art walk through the lofts and studios of Elysian Valley’s artists. Start your stroll at F&J Seafood Outlet. (A Ms. Go Go recommendation! Oysters! Fish tacos! Seafood dinners!). 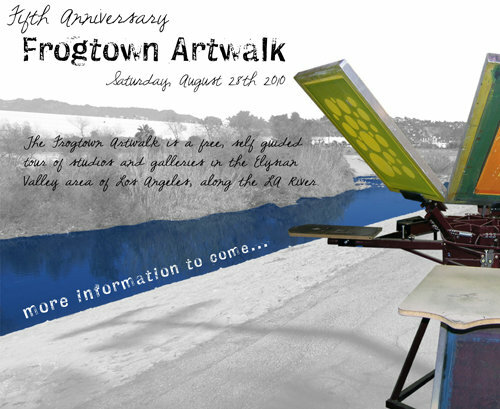 With a one-time-only coupon (see below), you’ll get a map and a bottle of water and the art walk sponsor (one of thirteen) will donate $1 to the Frogtown Art Walk Association. Don’t be startled by thumping as you meander; it’s not the frogs invading again but a youth art parade courtesy of the summer “Art and Drum Camp” sponsored by Gallery Frogtown. Big and little kids can join pro hula hoopers HulaHips (also at Stone’s courtyard) or watch two Elysian Valley-themed films on a giant, inflatable screen at Elysian Gateway Park while enjoying a frozen treat from the Icycle Bicycle or a taco from Tacos Kevin. Or, indulge your adult side with mixologist Nora Gordon‘s cocktails and DJ’ed dance music at RAC Design Build or bands Rough Duchess and Oakwood Brass Conspiracy at Framatic . And of course, there’s all the gorgeous art just waiting to be discovered and appreciated. OR visit the Frogtown Art Walk website/map, click on the star identifying F&J Seafood Outlet, and then the fish for your coupon. Previous Post Roots revival: the Grand Ole Echo returns.